Lianhe Wanbao’s e-paper is also available to subscribers, allowing readers to catch up on the paper’s daily news on their preferred digital devices. Lianhe Wanbao’s digital presence started as early as 2011. Its Facebook (FB) page has since garnered a strong following which exceeds 224,000. FB Followers can find breaking news and bite-sized stories, as well as daily quotes, exclusive snaps, living tips and more. 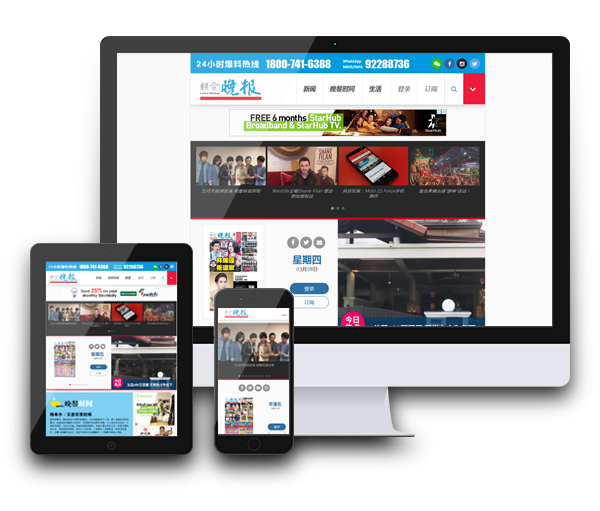 Since 2016, Lianhe Wanbao has been producing digital stories such as videos and live broadcasts daily with the support of Chinese Media Group (CMG)’s Digital arm, adding a new dimension to its print content. These digital stories are accessible on its FB, official website wanbao.com.sg as well as integrated online platform zaobao.sg and apps. Apart from social media and digital content, audiences can access Lianhe Wanbao’s e-paper via wanbao.com.sg and zaobao.sg on their preferred digital devices.